Ramallah (Agencies/ Web Desk): The Palestinian teenage girl turned protest symbol who was filmed hitting Israeli soldiers last year, has been released after serving an almost eight-month prison sentence. Ahed Tamimi, 17, and her mother, who also was jailed for incitement, were released early Sunday morning and taken by Israeli officials to the West Bank checkpoint of Jabbara, located south of Tulkarm near their hometown of Nabi Saleh. She was then taken by convoy to Ramallah to lay a wreath on the grave of the late Palestinian leader Yasser Arafat. 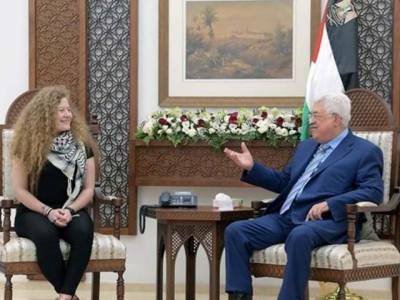 While in Ramallah, Ahed and her family met with Palestinian Authority President Mahmoud Abbas, who praised her as “a model of the Palestinian struggle for freedom, independence and statehood,” the official Palestinian WAFA news agency reported. The teen was sentenced in March to eight months in prison, after pleading guilty to four counts of assault, including the one in which she slapped a soldier in front of her house, which was videotaped and went viral on social media. She spent three months in jail prior to her plea bargain. The teen reportedly completed high school while in prison and had begun applying to colleges. Ahed’s mother, Nariman, also was arrested and charged over her involvement in the slapping incident, in which she filmed Ahed with a cellphone camera calling on her fellow Palestinians to stab Israelis, throw rocks at them and offer themselves as suicide bombers in order to “liberate Palestine.” Nariman Tamimi also was charged with incitement to terrorism on Facebook for posting the video of the incident. She reportedly also has accepted a plea bargain. On Saturday, Israeli border police detained two Italian artists who painted a large mural of Ahed Tamimi the West Bank security barrier in Bethlehem.